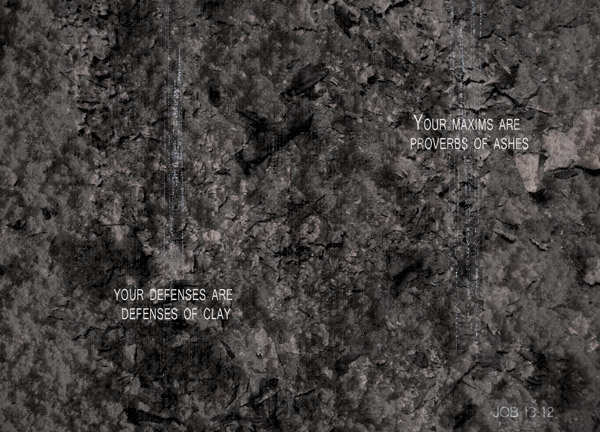 Your maxims are proverbs of ashes; your defenses are defenses of clay. Job 13 sees us entering into the last speech of the first round of debate between the 3 friends and Job, with Job’s response/defence against Zophar, and the longest speech in the book so far. Zophar’s argument might have been short, with him being arguably the youngest amongst the three friends and thus far more aggressive and emotional, and his theology while similar to Eliphaz’s and Bildad’s – that suffering is only because of sin – the foundation of his theology was based on assumptions, unlike Eliphaz (based on experience) or Bildad’s (based on convention). Why did Job have to give such a long speech in response to such a short one form Zophar in chapter 11? Job’s response to Zophar actually spanned across 3 chapters, even though half-way through it seemed that he turned away from his friends and turned instead to talk to God. Zophar’s argument, though short, was extremely sharp and hurtful, and it is often when men are maligned that we feel the greater need to defend ourselves. Are the theologies of Job’s three friends wrong? I think we have the benefit of the retrospect, and we can tell that most of what they said were wise sayings, great sayings, and most of what they said about God was in fact more accurate than it was not. The problem is, they used them wrongly on Job. It’s like you’re on trial for theft but the prosecution only calls up witnesses for a murder. In today’s study, we will examine how we humans are prone to apply many of our proverbs and much of our knowledge in the wrong way, and when used wrongly, how these proverbs end up as. Your maxims are proverbs of ashes – to put it simply, Job meant that their words of reasoning were useless to him. Their maxims were proverbs indeed – in every way wise and sagely, but like ashes, once blown, they will disperse and disappear. Can’t take a blow. A lot of what Eliphaz, Bildad and Zophar said were true. A lot of the theology that came out of these three wise men were correct. Their analysis and remarks on God and men were more often than not, accurate. However, it was that one most important thing that they simply couldn’t accept – that suffering is not necessarily only a result of sin. Righteous men can be subjected to suffering too. And using their experiences (Eliphaz), assumptions (Zophar) and traditions (Bildad), the three friends threw proverbs and words on Job without realising that they were addressing the wrong issue. your defenses are defenses of clay – Very much in the same line of logic as the previous phrase, with Job making the point that the arguments that his three friends put up were weak and will collapse easily. It will rot. At the end of the day, when we look at the wider scheme of things, as much as mankind has a million wise sayings from the oldest of times – the Confucius and the Socrates, every language and every culture has a bank of its own proverbs. Yet for all the worldly sayings, all the big, grand logics that we come up with, when we try to use these to replace God’s words, our proverbs simply become proverbs of ashes, and our defenses become defenses of clay. They become weak, they become meaningless, when we try to fit worldly logic into God’s kingdom. There are many worldly pieces of logic that you can take and compare against what the Bible teaches us. The world tells us to it’s okay to express ourselves in any way we desire. The Bible teaches us not to conform to the patterns of this world [Rom 12:2]. The world tells us to use any means necessary to get to the top. The Bible tells us that even if we earn the whole world, it is meaningless if we forfeit our souls [Mt 16:26]. There are many more, and surely you’ll know of more than I do. Let us not rely on our proverbs of ashes, but instead lean on God’s words of truth. And let us learn to apply God’s words with discernment, lest they become defenses of clay when applied in inappropriate contexts.